I met my best friend, Lisa when I was six. She was only five. Little did we know during those first few tentative moments of friendship that it would be the friendship of a lifetime. We were in junior high, when Lisa’s mother learned she had Huntington’s Disease. It was during the late 1970’s, and we knew two things: it would take her mother’s life, and Lisa had a 50% chance of inheriting the disease. She was a teenager facing her mother’s mortality as well the possibility of her abbreviated life. Lisa lived in fear that with any twitch, stumble, or even moment of forgetfulness that it was the disease manifesting. She refused testing; she was only a blood test away from knowing her fate. She wasn’t willing to give up her 50% chance of hope. I found Lisa Genova’s Still Alice captivating. And still when I have a moment of forgetfulness, I immediately think of Alice and wonder if it is more than a momentary lapse. 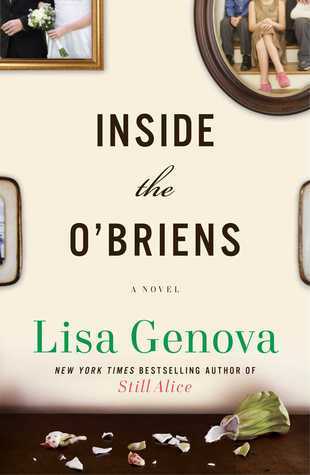 Genova’s, Inside the O’Brien’s, transports the reader into the lives of a working class Boston family as they face the diagnosis of an unfamiliar terminal illness. Told through the dual point of view which shifts from Joe, the patriarch and his youngest daughter, Katie the family grapples through all the stages of grief as they learn about the disease. Joe always thought his mother drank herself to death. She embarrassed him. He feels guilt for how he treated his mother as well as for the legacy he has possibly bestowed upon his four children. The story unfolds through Joe and Katie’s points of view, but the novel is about all six members of the family. The mother, Rosie clings to God then spurns him. The eldest, JJ is married and planning a family. The second born, Patrick works in a bar and spends most of his time with his friends. Meghan, the first born daughter, is a ballet dancer. Katie is the youngest. 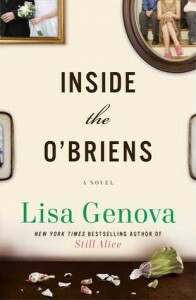 She is a yoga instructor, who covers her bedroom walls with graffiti, handwritten quotes in hopes that the view of “her exterior world would seep into her consciousness and perk things up.” She is in love with a man her parents would not find suitable: he isn’t from the neighborhood, he isn’t Catholic, and his heritage is not Irish. If she has Huntington’s, what kind of future can she offer him? How do you live with Huntington’s Disease? Is it better to know or to hold onto to that 50% chance of hope? I give Inside the O’Brien’s a five of five-star rating. About the number of stars, you’ll only see four or five stars here. I refuse to continue reading a book that doesn’t keep me interested. There are too many good books to force myself to suffer through one that doesn’t interest me. Lack of interest doesn’t always mean a book is bad; sometimes it just isn’t the right time in my life to read it.